Follow Northern Produced, Southern Seduced. We all have days where we are the cheerleader, dedicating every moment to rooting on our friends, family members and coworkers. Other days, we need a little extra love, whether it comes from those same people or from ourselves. Similarly, there are days in which the universe really seems to be putting us to the test. While the people around us may be quick to point the finger or shift the blame to us, often times, we are guilty of putting too much pressure on ourselves becoming our own biggest critics. The majority of the women that I know have quite the list of obligations. Full time job. Part time job. Other part time job. Part or full-time student. Mother. Caretaker. Wife. No two situations are identical. With all of the similarities and differences that exist, we can either allow for ourselves to become more connected and support one another or build up walls and push each other away. When I close my computer at night for the last time, no matter how much I’ve accomplished that day, I never feel fully satisfied. There is always going to be more work that can be done, and I need to get better at accepting that. I’ve never been that great at telling people “no”. However, I like to think I’ve always been quite the multitasker. Once I had Braylon I found a whole new meaning to this, and some days I’m convinced I have more than 24 hours in a day when I think about everything I’ve gotten done not including all of my work..and then other days not so much. Speaking of Braylon, well “being a Mom”…to all my Mom friends out there – when I was in my pre-Mom days if I ever said or did anything to Mom shame you, please feel free to slap me the next time you see me. Well, maybe not slap me, but steal my donut from me or something. Mom shaming is real y’all and you know what else is real? Mom guilt. So, Mama or not – be kind. Tread lightly. Or beware – you might unleash an inner beast. We tend to focus too much on the weaknesses of others and our own shortcomings, rather than pausing for a moment to find the positivity and strengths. It can be easy to get caught in a mindset where we focus solely on what is wrong about something rather than figuring out what can be done to grow and improve. Be sure to surround yourself with people who are building you up, rather than breaking you down and ensure that you are doing the same for them! Maybe a bit of early spring cleaning within your social (media) circle would not be a bad idea. While I am not suggesting to Marie Kondo your entire social network, but rather if you are finding that there are people that do not inspire you, or align with your goals, it might be time to have less of them in your life. I love staying connected with friends, family and colleagues via social media. The pros can be so so good, and the cons can take us down a deep dark hole leaving us feeling bad or just wasting time that could have been utilized in a much better way. When we’re able to avoid comparing, judging and envying and simply support, love and connect it really is such a great outlet! We live in a world that is quick to make us feel bad about ourselves, and then provide products and services to just as quickly make us feel better. This whole cycle would be a little less disastrous if we, as women, could make a conscious effort to use our words to make one another feel just a little better each and every day. Maybe you need to be a little less harsh on yourself, a tad less judgmental of others, avoid prematurely jumping to conclusions or a combination of all three. Whatever adjustments that you might need to make, do them with grace, strength and passion. And remember, you never know who else that you are empowering to do the same. We are eight days into the month that is most often associated with gratitude. As we near the holiday season, and quite possibly one of the busiest times of the year, we often find our to-do lists getting longer, stress levels getting higher and schedules overflowing with commitments. Prioritizing can be a challenge, and saying “no” can feel impossible as we try to spend time with family and friends, keep up at work and make time for ourselves. For some of us, we often move ourselves down the priority list as we put others first. Significant others. Children. Family members. Employees. Clients. When we do not make the time for ourselves, we risk increasing the chance of doing the exact opposite. While what that crucial “time for ourselves” looks like may be a little different for each of us, it plays an imperative role in the quality of our lives and the relationships that we cherish most. Similarly, as we take time to appreciate everything and everyone that we are grateful for, we often forget about ourselves. It sounds a little selfish, but self-gratitude is just as important as the gratitude we have for all of the people that we appreciate and positively impact our lives. In order to best serve them, we need to allow ourselves to be the best version of ourselves. It can be easier to complain than praise, recognize the wrongs rather than the rights and focus on the shortcomings of ourselves and others rather than all that we have accomplished. Ending each day by consciously acknowledging several things that we are grateful for, no matter how big or small, has the power to shape our attitude and consistently create a positive energy. Writing these things down or sharing them with someone else can only increase their power. A run around Florida’s Fisher Island with a slight breeze that kept me cool. Eating cold melon on a bench in the sun. A long and hilarious chat with Gayle about her blind date with Mr. Potato Head. Sorbet in a cone, so sweet that I literally licked my finger. Maya Angelou calling to read me a new poem. While I am pretty disappointed that I have not had the opportunity to get a call from Maya and have a poem read to me, I can most definitely identify with a good workout, enjoying healthy food, chatting with my bestie and eating ALL the desserts. Braylon being on board with being in his bouncy seat for 45 minutes so I could get a living room workout in. Spending time with my cousin and Aunt…and it didn’t hurt that they came with my favorite pizza! Memes and video clips that were sent to me by several friends. Amidst all of the seriousness and stress, a laugh here and there throughout the day really keeps me going…so keep ’em coming! The opportunity to see another day. It can be really hard not to get caught up in the hustle and bustle of things and allow our mind to divert down a negative path. I know for myself, I can often react too quickly, and at times, overreact (ugh, my Mother is probably reading this saying, “SOMEtimes? !”) when there really is not a need to. A lot of the people I know, myself included, are often going a million miles a minute and could use to slow down a bit. There is so much to be grateful for. Identifying and acknowledging the little things while expressing our love and gratitude for the big things can truly enhance our quality of life. One hundred days in to this little thing called motherhood. Some days, I feel like I just brought Braylon home from the hospital and other days, it’s as if having him here is all I’ve ever known. I knew my life would change, but I don’t think anything could prepare me for how I would become a new version of myself. For the most part, I enjoyed being pregnant. I was pretty nauseous and really really tired the whole first trimester, but comparatively speaking I think I was pretty lucky. Sometimes I really miss certain parts of it. …mainly having two hands available to do all of the things. Being really really tired found a whole new meaning in the “fourth trimester”. Sometimes I have to stop to remind myself where this little human came from. It’s truly mind blowing and such a precious miracle. Official theme for photos and videos of Braylon – CAN’T STOP, WON’T STOP. How can days seem so long, yet I’m constantly wondering how the heck it’s already 8pm? I’m a prisoner in my home. Oh, dear, please do not make me leave this house. Wait, when is the last time I left the house? When is the last time I showered? When is the last time Braylon had a bath? Do you seriously want to eat again? Did I not just change your diaper? Do I talk to a baby more than any adult human being? Allow at least an hour more than you think you’ll need. … and you’ll still probably be late. I’m feeling great about myself…. tries on real clothes that are not athleisure… just kidding. If there was a way to be a parent first than a kid what a magical place the world would be. Yeah, so basically Benjamin Button. I’m turning into my Mother and now as a Mother, I can only hope that I literally can turn into the superhero that she is. Sleep when the baby sleeps… oh, just shut up. No two situations are exactly alike, be veryyyy careful when offering new moms advice. Actually, be careful when offering any human unwarranted advice. The Internet is a terrible thing. For the first month and a half to two months I found myself reading so many different things online — daily emails, googling any and everything, going down a rabbit hole on message boards from the past decade… and it made me start to feel a little cray cray to say the least. I’ve definitely gotten a lot better at that and stopped obsessing (as much). I’ve never been good at asking for help. Asking for help with Braylon has been no exception. Hoping I can improve on this really soon. Like three months ago soon. Sometimes my mind starts to wander to the future and I try to bring myself back to the present. There’s no sense in ruining the next 24 hours by stressing about the next 24 years. I’m really trying to actively be present in the moment with Braylon. If it weren’t for my Mom, I would have most definitely lost my mind. Taking care of a baby is a full time job. Honestly more hours than a full time job. Laughing in his sleep. Priceless. Seeing himself in the mirror. Even better. Laughing at my jokes…. what, he’s not laughing at my jokes at this point? Oh, ok.
At this point, I’m pretty sure I can stand in for any person on Martin, Fresh Prince of Bel Air or The Office. Caffeine and I became friends again. I tried to stay away, I really tried, but working more than forty hours a week and taking care of Braylon in the midst of everything else going on… it just wasn’t happening, honey. I had hopes and dreams of blogging more once I was a Mom…. still waiting for that to magically happen… soon. I’ve always hated doing dishes, but now it’s on a whole new level. The dishes can get done tomorrow. “Being a Mom” counts as a workout, right? Just like early on during my pregnancy, I planned to track EVERYTHING that happened with Braylon. I quickly found that I would rely on photos, videos and various text / Facebook messages to piece it altogether. Guess it’s never too late to start and create a better log! My Mom has always talked to herself (out loud) for as long as I can remember. I’m convinced this originated with talking to me as baby and it just never went away… because even once Braylon can talk or is off doing his own thing, I don’t think I will be able to stop. Oh, and this one…”Sometimes it doesn’t matter what your friend, coworker, relative, stranger, ANY other person felt, didn’t feel, did, didn’t…during their pregnancy. Sometimes, you just gotta focus on Y.O.U…. Or maybe all the time?” Just replace pregnancy with… LIFE. I remember having really bizarre dreams throughout my pregnancy. Now, I RARELY recall any dreams. Is that because I don’t get into the deep sleep cycle EVER?! Did this happen to anyone else? Stealing another one. “Almost there. Yes, with this post but I’ve found this being a common theme over the past months. Planning is great and all, but there are certain things in life, like pregnancy, that you just have to kind of go with it. Take it as it comes. One day at a time. I tried (key word tried) to stop obsessing about things as much as possible. Focusing on what needs to be done in the next few hours…next few days… and so on. I’m quite the planner when it comes to work and my personal life, but have tried to channel even more of the need for planning into my work and take a little bit out of my personal life. It’s a work in progress.” I need to take my own advice. How can a baby grow from milk and milk alone? It blows my mind. If you thought the 50 Shades of Bay post was all over the place, there’s a strong possibility that IF you’ve made it to this point, you’re just going to throw in the towel. Is it possible to kiss your child too much? Asking for a friend. The 24 hours before Braylon’s arrival and first few days after seem like they took place on another planet or during a different lifetime or were just a figment of my imagination. Wow, I’m a control freak. I most definitely can not do it all. No, I can do it all. I’m convinced this car seat weighs 50 more pounds than it actually does. I won’t write about the wide range (extreme opposite ends of the spectrum) of thoughts that I had about my marvelous significant other. The dishes are still not done. He’s been sleeping so well. How is it already 8pm? Ok, what year is it? This is the worst day ever. Just kidding, this is the best day ever. Is it possible to say anything without providing the person with some type of justification / logic behind it? It shouldn’t take me too long to do this… *narrator* It took her much more time than she thought it would to do this. How’s old the baby? …. I don’t even know. The other day I accidentally said three and a half weeks. Can someone please give me an IV? It is not possible to consume as much water as I need. How do people have more than one child?! Oh my gosh, I’ve got this, let’s have another! Some days I think I have more conversations with myself (in my head and out loud) and with Braylon than I do with adults. Also, half the time I can’t differentiate from the conversations in my head with the ones that I’ve had with people…Did we actually talk about this or did I just imagine we spoke about this? I want you to stay little forever… a few minutes later… I can’t wait for you to grow up… a few minutes later… I want you to stay little forever! It’s hard to think back to what life was like before becoming a Mom even though it wasn’t long ago at all. One thing is for sure — I wouldn’t trade it for anything. If you’re still here, I owe you a drink or a donut or something. It took so much longer than I anticipated to get to 100. Guess that’s quite appropriate for what this post is about. Hope you have a marvelous Sunday and maybe this even prompted a nap! Dono&Dono Baby Playtime Pillow – Braylon isn’t a huge fan of being flat on his back. He had been doing pretty well being on his back when he was playing on his Little Sport Star All Star Gym, but figured I would give this pillow a try. Not sure if I can give all the credit to the pillow, but he definitely seems to be lasting longer and enjoying himself more. Love that the pillow is machine wash friendly. I’ll never understand when things like athletic wear or something involving children do not scream convenience. Swedish Fish Mini Tropical – I really really like Swedish Fish. Always have. Always will. Randall had sent me a screenshot of the tropical version and I knew I HAD to get my hands on them. Luckily, before I knew it the grocery store that I frequent got them in, so I didn’t have to do too much hunting. I just looked them online and a number of websites are sold out out of them. The flavors are Pina Colada, Tropical Island, Beachy Punch, and Passion Fruit. Helloooo, summer! Donut Ice Cream Sandwich at KNEAD Doughnuts – It’s no question that I love donuts. It’s also no question that I love ice cream. When the two have the opportunity to meet, something magical can happen, especially if both the doughnuts and ice cream are exceptional. Sometimes, when there’s “mashups” one of the products will be mediocre and man, what a let down. However, the doughnut from KNEAD and ice cream from Warwick Ice Cream was a match made in my sweet tooth heaven. The Cookie Rookie’s S’mores Cookies – My Mom was in town earlier this week for a few days and she made the S’Mores Cookies from The Cookie Rookie and they were SO good. They seemed pretty easy to make, but hey, my only job was eating them. The main “hack” here is that the recipe suggests using pre-made refrigerated chocolate chip cookie dough. The hardest part looked like crumbling the graham crackers and if you really wanted to, I’m pretty sure stores sell it that way. Peapod Grocery Delivery – My Mom recently ordered us some deliveries from Peapod. I always thought why would I need someone to bring groceries to my house when I can just go down the road and get them myself? Then, I had Braylon and I more than understood it. A lot of the time I dread going to the grocery store. Mainly, because no matter how hard I try, I just never go in with a solid plan. More often times than not, I’m hungry when I go, which is a huge no no. We had another delivery since the first one my Mom had placed for us….I love it! They offer $20 off your first order of $75 (I can’t make out of the grocery store spending less than this anyways!) or more and the first 60 days delivery is free. You just need to enter 60DAYSFREE in the promotional code box at checkout. Hello Fresh – My friend, Mary, introduced me to Hello Fresh a few months back. I had been seeing a handful of different meal kit delivery companies and had been wanting to try one so took her recommendation on this one. Plus, Hello Fresh provides their customers with the option to gift three free meals to friends. Who doesn’t love free?! Speaking of, if you’re interested in receiving your first week free (3 meals for 2 people) let me know. No gimmicks or anything like that. You just need to remember to either skip the next week if you don’t want that particular one or just cancel altogether. I had been ordering pretty consistently, but depending on what I have going on that week I do end up skipping sometimes. Some of them require a bit more prep work than others. The great part about that is you can preview the ingredients and recipes prior to placing your order. They also provide you with additional insight on each kit that could most definitely ensure that the meals that you are ordering are the best fit for you! Hungryroot – Years back, before they expanded, I had tried a few things from Hungryroot. Since then, they’ve grown and have a lot more options. While I would prefer to just make my own chili, the flavor on this was pretty good. While there was enough for two servings, I could have eaten all of the salad with my burger rather than splitting the salad between the two burgers. Loved the flavors and haven’t had a veggie burger quite like this before — it was great though! This was pretty good. I had some one night (with something else) and then the rest of it the next day for lunch. My Mom was in town during this one so we split it. We both liked the flavor. She cooked the sweet potatoes a little longer than suggested and utilized more than 4 tablespoons of the curry. They give you much more than 4 tablespoons and 4 tablespoons would be like nothing. Still can’t figure this out. This was meant to be a side dish. I did split this one up. I used ALL of the pesto sauce…homegirl is not on board with this only 4 tablespoons madness. Sometimes I struggle with eating beats so having a strong flavor like pesto to mask it a bit was perfect for me. There was enough tofu for two servings, but not enough quinoa, so either I was missing something or the portion of quinoa was supposed to be really really small. I did really like this though. The tofu had a great flavor and consistency. You didn’t need to cook anything — just mix the tofu into the quinoa bowl and voila! I ate this all in one serving. If I was going to split it up, I feel like I would have needed to add additional vegetables or meat to it. While I enjoyed this dish, calling it mac n cheese is an incredible stretch if you ask me. I like to think of myself as a mac n cheese connoisseur and that does not mean that I discriminate against a vegan version or a version that does not utilize pasta. The cashew cheese had minimal flavor even when I added more than than the recommended 4 tablespoons. I love sweet potatoes, but you really can’t put cubed sweet potatoes in a dish that you are calling mac n cheese to give me my fix. Don’t get me wrong, I did eat it, but just think it should be called something else — cheesy sweet potatoes? I ate these in the car one day. They were pretty good. I’ve had something similar to them before for sure. I haven’t tried this cooked yet, but straight out of the container I was pretty surprised with how tasty this was. Will definitely need to throw some in the oven to give it the true test. I want to hear from YOU! Products I need to try? Places I should go? Any and everything you name it! If you’re anything like me you’re overwhelmed by creating and / or purchasing from a Baby Registry. I was super excited to start mine once we found out we were expecting. I quickly realized how time consuming it was…and that was before I even stepped inside the store. One of the reasons I chose Babies ‘R Us was due to the great perks they offered. Unfortunately, the closer I got to my due date, the closer the store got to closing. Using my completion discount became a little tricky and they decided not to honor hundreds of dollars in rewards that I had accumulated. Needless to say, I was pretty disappointed. I was also registered at Amazon. If I knew someone that was getting ready to register now, I would definitely recommend Amazon and then choosing one with a storefront as well (ex. Target or BuyBuyBaby!). You can easily sync all of your registries on The Bump making it easy to see all of your wish list items at the same time. If you or someone you know needs any help, feel free to point them in my direction or maybe my Mom’s…I think she outdid me with the amount of time and effort she put into preparing for Braylon’s arrival! Here are 12 products that I wanted to share with you. As I am sure you can imagine, there’s definitely some additional “mama products” that I am using a lot right now and more will continue to be added into our daily routines. Storksak Sandy Diaper Bag – Braylon’s Daddy got this bag for us and I absolutely love it! The pockets on the inside and outside are perfectly sized and placed. The bag comes with a high quality changing mat and food and bottle bag. It’s a great size and easily attaches to my stroller via the stroller straps. Jeep Everyday Backpack Diaper Bag – I couldn’t make my mind up on whether or not I wanted a bag or a backpack, so wound up with both. The backpack doesn’t have as much space, but most definitely holds all of the essentials and is great option depending on what we have on the agenda for the day. I’m only 54 days in to this whole Mom thing, but imagine that both bags will get plenty of use! Vitafusion Prenatal Gummy Vitamins – After I left the Doctor Office confirming my pregnancy (because 4 at home tests were not enough) I stopped by CVS and purchased some prenatal vitamins from The Honest Company. I am not sure if it was because I was still early on and extremely nauseous the majority of the time, but the vitamins did not seem to be sitting well with me. I ended up switching to the gummy vitamins from Vitafusion and LOVED them. Yes, I feel like a child taking them, but whatever. I’m just about seven weeks postpartum and still enjoying them. Burt’s Bees Mama Bee Belly Butter – My best friend, Ashley, gave this to me in October and I have been using it ever since. The majority of the time, I used it on my whole body rather than just the belly. Whether or not this butter was the reason I did not get any stretch marks during my pregnancy will always remain a mystery. Either way, I enjoyed the fact that it was fragrance fee, the consistency and how it made my skin feel and look. Gerber’s Knit Burp Cloths – The color / print of the ones that I have are a little different than what you see in the below (I think they may have been a Babies R Us exclusive), but highly recommend these. I loved the material and how they absorb the milk so easily. I have a handful of flannel ones from Gerber and Koala Baby, all of which work well, but the material of the ones below has been my personal fave! The First Years Night Cravings Bottle Warmer & Cooler – I haven’t taken full advantage of this product’s features just yet. Behind the bottle warmer portion, two bottles can be kept cool, so you could easily have the bottles in the nursery with you and then pop them into the warmer for your convenience. I am mostly still breastfeeding, but have given Braylon bottles, so I’ve used the warmer to heat them up. Where we live right now, Braylon’s room is not far from the kitchen, so having this in the nursery is not entirely necessary, but this would be a great feature depending on the layout of the house. At some point I may find that I will take full advantage though! Munchkin Steam Guard Microwave Sterilizer – Easy to use and store when not in use. You add 7 ounces of water to the container, throw it in the microwave with two minutes with the bottles, pacifiers, breast pump parts, etc. and then let it sit for another 10 minutes and voila! 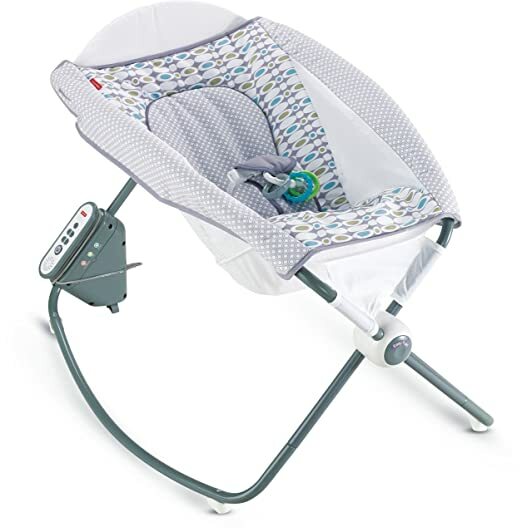 Fisher-Price Auto Rock ‘n Play Sleeper – Braylon really really likes this. A little too much. I’ve basically made myself crazy with all of the things that I’ve read on the do’s and do not’s of sleeping and people have mixed feelings (uhhh, beliefs?) on this product, but this thing has been marvelous in our house so far. Baby Trend Skyview Plus Travel System – I haven’t utilized the stroller in it’s full capacity, but so far so good for the most part. I wish the “peek-a-boo” window made it a little easier to see the baby and that it had velcro on the flap to keep it open (considering adding my own). Only complaint with the car seat, when securing him into the seat, you have to hold the two buckles perfectly aligned over one another to pop it into place…and it’s a little tricky, but with time I’ve gotten better at it. The car seat is 11 pounds (assuming this is average?! ), so now I’m lugging around 33 pounds – talk about a bonus workout! Jensen Portable CD Player – I just purchased this today! I’ve been meaning to pick up one or order one online since my baby shower when I got three different CDs (see below). I love the size of it and excited that it has Bluetooth capabilities too. We’ve already tried it out and so far both Mommy and Baby love it. Rockabye Baby Lullaby Renditions – I received the Jay Z and Rihanna versions at my baby shower and FINALLY heard them for the first time today. LOVE them and would definitely recommend. I also received this Hip Hop CD, which has songs from Outkast, Salt N Pepa, Eminem and more! Spacedye Hug The Belly Maternity Long Legging – If you’re pregnant, know someone who is pregnant, planning to get pregnant, heck even if you’re not pregnant… I can’t recommend these pants from Beyond Yoga enough. They are on sale for $57.50 (normally $115) and if you use code oRNrpX at checkout, you’ll get an additional 15% off. If the code gives you any trouble just click here. NOTE: You can use the 15% off anything, not just *these* pants. What are your favorite products that you use as a Mom?! Any must try products in general? I’m open to anything — food, books, gadgets…you name it! On Sunday, March 25th, I told my fiancé, “Hey, at first I thought my water broke, but I think we’re good…so I am going to head to take class!” He looked at me confused (as he should) because 1. if my water broke why would I be heading to class 2. if it didn’t what the heck was I even talking about? On my way to class (22 days before my due date)…ok, maybe I did look ready! I showed up to the studio and tried to play it cool, but by the end of the class (it was a class for just teachers) everyone could tell something was off with me. One of the owners hopped in my car with me to drive me home and another owner followed in her car. I kept insisting that everything was fine and that I would give the doctor a call. I eventually called the doctor, but not before finishing off some Papa Gino’s…just in case baby boy was going to make an early appearance – I did not want it to go to waste. At this point, I still figured it would be at least a few days before my little homie showed up. I had Braxton Hicks contractions throughout the entire third trimester and as the day progressed I noticed that they seemed a little more frequent, but still had no pain associated with them. Just to be safe I went ahead and showered, packed my bag for the hospital and did some things around the house. As the evening started, I continued to have some signs (I’ll spare the details) that baby could be coming earlier than expected, but at this point, I think I was still thinking I had at least another week or maybe a few days. 10:00pm rolled around and I started to track the contractions because at this point there was a lot more power and pain coming along with them. During my pregnancy, when I had Braxton Hicks contractions, I would really focus on breathing through them even though they weren’t painful. This proved to be extremely helpful once the real ones started. I would also focus on my breathing (more than usual) when taking Pure Barre and Pure Empower classes. I kept telling myself, and others, that I was training for the big day. I tracked the contractions, and did not sleep, through the night. Trust me, I would’ve slept if I could but could not find any position to sleep in as I started to get more and more uncomfortable. Tracking the contractions on an app was extremely helpful. As soon as one would start I could hit the button and then hit it again once it ended. That way, I knew how long the contractions were lasting and how far apart they were. For a while, they were kind of all over the place as far as how long they were lasting and how far apart they were. I would have some that the window would get a little smaller and then the next one wouldn’t come for a while. Somewhere in the middle of the night, I started to accept that I would most likely not be going to my doctor appointment in the morning, but would be heading to the hospital instead. Right around 5:00am, I had two contractions that were about 7 minutes apart, but then the next one would be a little longer. It was back and forth like that for a little bit, then right around 7:00am, sh*t started to get really REAL. I started to think that maybe I waited too long and we should have already been on our way to the hospital. The pain was progressing A LOT and I calmly let Randall know that we needed to leave ASAP, but it was going to take some time for me to get dressed since lifting up my legs to get pants on did not really seem to be an option. Eventually, we made our way down to the car and the 20-25 minute ride to the hospital felt like it lasted at least an hour. I was holding on to the handle above, blaring gangsta rap and wondering why the hell we were not going above the speed limit. As soon as we pulled up to the hospital, my water broke. We got inside, got situated and confirmed that it was in fact my water (for real this time) and that I was already 5cm dilated. On our way upstairs, I let them know that I did NOT want an epidural, but needed something. By the time we were upstairs (probably took a few minutes), I remember asking how much longer this was going to last as a contraction seemed to take the life out of me. They let me know it would be at least a few more hours. I was so set on not having an epidural, but then found myself saying, “Ok, I know I said I didn’t want one, but how quickly can I get one?” I had really hoped to power through but after not sleeping through the night and how things were progressing, I gave in. I 100% do not regret this decision. I know every person is different and everyone’s body receives thing differently, but the epidural was absolutely magical. The contractions overrode any potential pain that could’ve came along with getting the epidural and I was pleasantly surprised that I could still move my legs. I was under the assumption that I would basically be temporarily paralyzed from the waist down. Around 12:30pm, the nurse let me know that we would start pushing in an hour. OH MY GOODNESS, in just ONE hour, I was going to be meeting my son?!?! Looking back the entire 24 hours was so surreal, especially once we got to the hospital on Monday morning. I’m truly blown away at what the female body is capable of and how it just kind of knows what to do. A little after 1:30pm, the doctor and nurse came back in as promised…and Braylon Kirk Thompson made his debut at 2:04pm. I vaguely remember having a conversation with the doctor and nurse letting them know that what they were asking me to do during the delivery was basically a “tuck” that we do in Pure Barre. I really had been training for this for years! The doctor said it was one of the best deliveries she had seen and had no doubt that me taking Pure Barre consistently during my pregnancy played an incremental role in that. I took my first official class exactly six weeks after having Braylon. I had went to the studio a couple times prior to that and marked through a couple of classes, but given the distance I am to the studio, lack of sleep and everything going on, I didn’t take an actual class prior. For most women, it’s the norm to wait six weeks after delivering – sometimes more or less depending on a number of factors. While I do think I could’ve taken a class before the six weeks, taking class this past Monday night felt perfect. I found out I was pregnant in August, so for about eight months, I had a workout buddy with me no matter what. At first, it was not known by most and I loved keeping my little secret. Right at the end of the first trimester, I let all of the clients at Pure Barre Cranston know that I was expecting. I remember heading to the studio and made the decision I was going to tell my classes that night because I was really starting to show. Looking back, I kind of just looked like I went to town on a dozen donuts, but whatever. I didn’t anticipate that I would go through so many emotions during my first class back, but I did. So many things popped into my head. First, the majority of the Pure Empower classes that I had taken, were done while I was pregnant. Early on that didn’t mean that I was modifying too much, but as it became harder and harder to engage my core, I had to modify a number of things throughout class. I had to remind myself that I would not be back to pre-pregnant Danielle instantly and should still modify as needed in order to avoid overstraining anything. I like to think of pregnancy modifications like a slow climb up a hill and then you have to make your way back down. Basically at the bottom you don’t need to modify and then at the peak of the hill (aka the end of your pregnancy) you are modifying the most. After baby, you’re not automatically back down where you started from, but you need to work your way back down the hill. Some people get there a little quicker and others needs a bit more time. I’ve always loved how strong Pure Barre makes me feel. It’s a different type of strong than any other workout. I’ve felt strong running, strong doing yoga, strong in cardio dance classes, strong doing CrossFit, but have always felt a special type of strong in Pure Barre. Taking class while pregnant introduced me to a new type of strong. For years, I had suggested and explained things to pregnant clients, but until experiencing it first hand on my own body I never truly understood it to the level that I wanted. Basically, I got pregnant to become a better Pure Barre teacher…just kidding. But seriously, I remember seeing clients opt to do certain things while pregnant, that I eventually opted out of it — remember, everyone (and every day) is different and that’s ok.
Now, post pregnancy, I’m so excited to see and feel the changes that my body goes through as I got back to the barre. It’s like Braylon has instilled a whole new level of strength and empowerment in me. It’s literally mind blowing what the female body is capable of. So, that’s my story in a nutshell. My attempt was to make this a short post, but I failed. I could honestly go on and on for days, but don’t want to scare any of you away. Now, a little over six weeks postpartum, I am learning so much about myself and Braylon every minute of the day. This first month and half of motherhood is everything that I dreamed it would be and then some. I know everyone says it, but until you are “in it” and experiencing it for yourself nothing or no one can truly prepare you for it. You’ve just got to take each day as it comes, find a balance of taking advice and not taking advice and knowing that being imperfect is in fact perfection. The majority of my days, as the sun is setting, I look at Braylon and think where the eff did the day go?! I know they tell you that it flies by and I have no doubt that it does. Some moments I feel like a rockstar and others I want to throw my computer and phone out the window so I can’t google anything in regards to what I should and should not be doing. In just 46 days with Braylon here, I feel like I’ve already learned so much…and I know the journey has just begun. As I write these last few sentences, I look at him and start to tear up.. partially because he just started crying and partially because I still can’t believe that this little human is really ours. …now Braylon and I are both crying. It’s really happening! I haven’t wrote much about my pregnancy (or blogged much at all I guess for that matter), but as we are approaching the home stretch, I had a number of thoughts that I figured I would share. Pregnancy is quite the interesting experience. Especially if it’s your first time and the only thing that you have to compare it to is… not being pregnant. Pregnancy is different for each individual and most of the women I know who have more than one child have told me each of their pregnancies varied greatly. Most of the time, people don’t know what to say and half the time when they do, it’s not what you want to hear. As women, there’s all sorts of expectations that are set for us by society, men and other women. As a pregnant woman, I think it enters a whole different level. As a pregnant woman working in the fitness industry, some days it seemed like it entered a whole different realm. I mean, it’s pretty true, right? Add in all of the changes that your body goes through during pregnancy (yes, I realize what happens post baby is going to rock my world, you don’t need to start schoolin’ me on that just yet) and you’re in a whole different ballpark. One moment you’re embracing all that your body is capable of (and will be capable of) and the next you’ve called your Mom and blindsided her with a rage filled rant. 1. “I guess Red Bull no longer works for me. I just drank a Red Bull and I am falling asleep. How can I be this tired? I must have finally become immune to it.” *newsflash – you may be pregnant* Right after I found out I was pregnant I made the decision to say see ya later to my wiiings. Yes, I know you can have caffeine during pregnancy, but I had gotten back in quite the cycle of Red Bull consumption so it was the perfect opportunity to kick it to the curb. Additionally, caffeine tends to give me a bit of anxiety and I wanted to make sure I was doing everything I could to eliminate any additional anxiety at this exciting, but slightly terrifying time. 2. There’s a Meme (several variations) that says, “Do you ever look back on old photos when you thought you were fat, but you really weren’t and now you actually are fat and wishing you were fat like back then.” Chill out, I’m not calling myself fat, but this does make me laugh because when I look at pictures or videos that I took earlier on to show “the bump”, I’m like, “Girl, you look like you just had two cheeseburgers instead of one, you don’t even look pregnant.” And now I’m like “Ohhhh, yeah you look pregnant.” Can’t wait to see what I will look like in the next 7 weeks or so! 3. You are the best thing that’s ever happened to me. I love you so much. You are going to be the best husband and father. How did I get so lucky? Literally heaven sent. 4. Five minutes later…Why are you breathing like that? Did you always chew that way? Is that a new cologne – it smells terrible? Why are you in the same room as me? Why are you not doing exactly what I want you to be doing even though I haven’t told you anything? 5. Five minutes later…Omg, I love you so much, I could just look at you forever and be around you nonstop. 6. Using pregnancy as an excuse. Alright, alright, a lot of the times it wasn’t an excuse. Buttt, sometimes, I just felt like I was behaving like when people get to that age where they no longer have any filter and just say exactly what they are thinking. 7. You use your core A LOT for pushups. I mean, obviously…but as things progressed, I started to become VERY humble. I suppose the extra weight doesn’t help either. 8. I never knew how much toilet paper I could go through. Does walking to the bathroom 800 times a day count as exercise? I guess this is preparing me for the millions of diapers we will go through. 9. 4am – So much energy. So much drive. Let’s write a book. Let’s clean the house. Can’t wait to seize the day. PLEASE just fall back asleep. I wonder if I am going to be a good mother. Maybe I should research _______ (fill in the blank with the most random things possible) The rollercoaster sleep patterns… again, I am sure just another way of your body preparing you for what’s to come with never sleeping again once your little bundle of joy enters the world. 11. “Wow you’ve really popped.” “You’re getting bigger and bigger every time I see you.” “You sure there’s just one in there?” “Oh, wow you still have ____ weeks left?” Hey, people, you’re supposed to get bigger during pregnancy. Homegirl is growing a human inside. Thanks for stating the obvious. 12. I didn’t have weird cravings. However, when a particular food popped into my head, I got pretty set on it and nothing could stand in my way. Wait, is that any different than not pregnant Danielle? Whether it was a spinach salad with goat cheese, cranberries, almonds and balsamic vinaigrette dressing or McDonald’s french fries and a caramel sundae… get out of my way, honey. Speaking of honey, I’ve been obsessed with making acai bowls and there HAS to be honey drizzled on them. 13. My favorite foods rose to a whole new level. There were several times that I almost cried when eating certain foods because I was so happy. Couple of things that come to mind… Papa Gino’s pizza and Knead Doughnuts. 14. This is taking forever. This is flying by. *thinks about childbirth*…. can I just skip that part? Maybe stay pregnant forever? If people have more than one kid, it can’t be that bad, right? No, it can be. AHHHHHH. What have we done!? Is it the same way when you say “I am never drinking again”? “I am never having another kid.” And then somehow, someway you enter the dark place again and before you know it… HAAALP!? 15. Ok for real, how can a baby have that much power already with kicks and punches? Are you trying to hurt me? 16. Did I always talk to myself this much? Even if it is just in my head and not out loud? I swear, I’ve had more conversations with myself than ever before… or maybe this is how I’ve always been? Or am I more clearheaded now that there’s no alcohol or caffeine in my life? 17. …well, sometimes they’re not just with myself. I can talk to little guy because he has no choice but to listen and can’t talk back (yet). It is odd (and amazing) for how 9 months you’re never *alone*. Especially once it got to the point where I could feel him moving… it was a constant reminder, along with my growing waist line, that I always had him with me. 18. You just ate. How are you hungry again? Me, not him. Yet again, I guess this is how newborns are too… The other day, I told my Mom that I had to eat again, because the baby was hungry. I think we both know that it doesn’t work like that, but hey, it seemed like a great logic for me to head to the kitchen again for breakfast #3. 20. These pants didn’t fit last week, so let’s try them again this week, surely this will fit. Give it up, girl. 22. There are some people that just know exactly what to say sometimes. Cherish those words. More importantly, cherish those people. 23. I’ve eaten more of Annie’s Organic Bunny Fruit Snacks than I ever thought imaginable. My best friend, Ashley’s son loves them, so at least maybe her son and mine can share them together at snack time in the future…unless I steal them from them both. 24. Dance while you’re pregnant. Even if the only place you feel like doing it is while you’re home alone. Just avoid socks on wood floors. 25. Teach a toddler that there’s “a baby in your belly” so they point to other woman’s stomachs and say baby!… Sorry, Britt. 27. Know your limits. I had plans on teaching Pure Barre up until the last possible month. I finally came to the realization for a number of reasons, that it was time to drop the mic… I’m still having a bit of anxiety about it and wondering if I am going to really stay away… but the clock is ticking and if I don’t get back on it soon, I will see ya post baby, chicas! 28. Speaking of limits, for years I’ve seen other teachers and clients do certain things in class during the pregnancy where I was like daaang, girl. As things progressed, I learned that just like I always preached, that every client / teacher is different, I too, would be different. Some days it was more humbling than others. I never thought that I could develop a deeper connection with my body, but taking class during pregnancy, I go into a whole different zone… Talking myself through every aspect of class. While every day is different and some days I would modify more than others…over time, I got to find how even though I was modifying, I was able to challenge myself in a whole new way. I could probably write a lot more on this… so I will save that for another day. 30. Have you fallen asleep yet? I sure haven’t. I’ve never been a big napper, but every so often these days, I find myself knocked the heck out. Earlier today, I was on the couch and the next thing I knew I woke up two hours later…whoops! Overall, I’ve still had a lot of energy and felt pretty good (once I made it through the first trimester) but, I’ve really learned to listen to my body even more. Plus, everyone tells me to sleep now while I can…as if that’s going to make it any better when I don’t get to sleep once he gets here. 32. I can see why a lot of celebrities like to stay out of the spotlight during their pregnancy and / or keep their little ones to themselves early on. Like back off, weirdos. 33. My hair is the healthiest it’s been in quite some time…which could be thanks to the vitamins, lack of washing / blow drying / straightening / coloring it… but, one thing I am most definitely not complaining about. 34. My nails on the other hand… they’ve gone through phases of being long and strong and then brittle and breaking… what’s up with that? 36. I lose track of how long I am in the shower. I’ve always taken long showers, but now, I legitimately question whether or not I need to set a timer or something. However, I do end up coming up with some really great ideas while I am in there, so it is pretty productive. 37. I’m excited for all my friends and family to meet the baby, but most excited for my parents and Randall’s mom to meet him. For them to get to see their kids creating a kid must be pretty cool… right? 39. Typically I can tend to be pretty emotional and cry easily… but since, I’ve been pregnant it’s been weird. Things that SHOULD make me cry, don’t…. and then other times I’ll get emotional about something so random. I mean, don’t get me wrong, there are certain things that should get the waterworks going… and do… like this. 41. It’s definitely hard when I think about that Samantha won’t be here to spoil her nephew or that Randall’s dad won’t watch his son become a father, but I know that they, along with my Papa, Peter and everyone else who is no longer physically with us…. will be so proud of us as they shine down all of their love and protect over Baby Thompson. 42. I feel like I’ve always had really bizarre dreams. I didn’t think they could get any weirder…but they have. Will this get better or worse post pregnancy?! 43. Almost there. Yes, with this post but I’ve found this being a common theme over the past months. Planning is great and all, but there are certain things in life, like pregnancy, that you just have to kind of go with it. Take it as it comes. One day at a time. I tried (key word tried) to stop obsessing about things as much as possible. Focusing on what needs to be done in the next few hours…next few days… and so on. I’m quite the planner when it comes to work and my personal life, but have tried to channel even more of the need for planning into my work and take a little bit out of my personal life. It’s a work in progress. 44. I know everyone always says it, but how can you already love someone so much that you’ve never even met? The anticipation is killin’ me! C’mon and get here… well no, not yet… but you get the idea. 45. Are baby registries supposed to take days upon days to create? I felt like it took me forever to create / finish it. Was that just me? I finally had to cut myself off from it. 46. How is there another Danielle Cote having a baby around the same time in Rhode Island? 47. In my blog post from November 11, 2016, I’m Coming Home Again, I had concluded with …. “This isn’t a new chapter….it’s a whole new book.” Funny how life works out…. little did I know all that would happen in the months to come! 48. I’ll never not be worried about what my Mom thinks about the decisions that I make and what I do…. when I called her to share the news, I somehow felt like I was 15 years old confessing to something. I’ve never been good at lying to her or keeping anything from her… I guess that’s a good thing. How do I instill this fear in my children?! 50. The best is yet to come. This is the most all over the place thing that I have ever written… If you made it to this point, you deserve an award.